I'm so in love with my slow cooker, that recently, I've talked two of my friends and my sister into buying one. Slow cooker baked potatoes is one of the recipes I tell everyone to try. I love baked potatoes (who doesn't, really?)! Quick weeknight dinners--they are ready when you get home! It does not heat up the kitchen like running the oven for an hour does. You can prepare them the evening before* to plug in the slow cooker in the morning. You can prepare extra potatoes, cool them, and make twice baked potatoes the following day. Barbecuing? Add them to the top rack to crisp up the potato skins. *There is no need to poke holes in these, they will not explode. If you poke holes in them and leave them sitting overnight, they will turn black. So...don't do that. Wash potatoes. Make 4 or 5 little "balls" of tin foil to place on the bottom of the slow cooker pot. This will provide more even cooking. Place each potato onto a piece of tin foil, brush with olive oil, and sprinkle with sea salt. Roll up tin foil to cover potato. Place each potato in the slow cooker, and place the lid on. Cook on low for 10 hours or high for 6 hours. If you are grilling other foods to go along with your potatoes, carefully unwrap the potatoes from the foil and place on the top rack of the barbecue for a few minutes to achieve a smoky flavour. Made extras? Make twice baked potatoes! 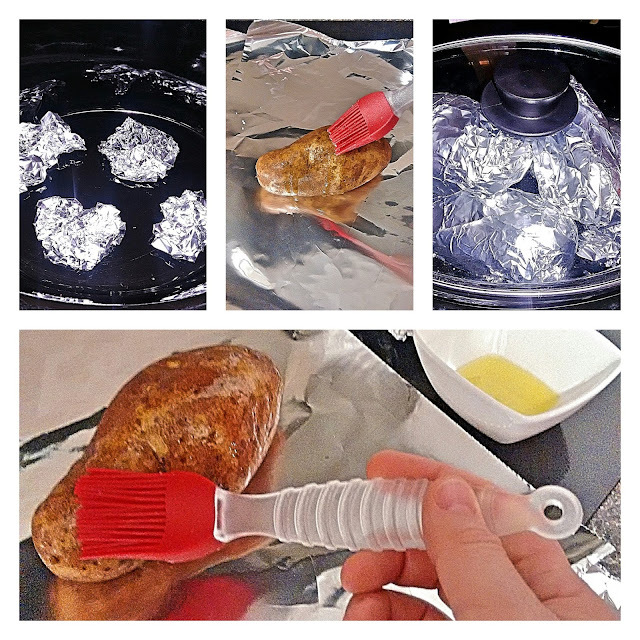 I like to make a couple extra baked potatoes, carefully unwrap them from the foil, and place them on a cooling rack. They will take about 2 hours to cool fully. Once cooled, place them in a tupperware container or wrap them in plastic wrap and refrigerate. The following day, slice potatoes in half and scoop out the centre, leaving enough flesh behind to maintain the shape of the potato. Put the scooped out potato into a mixing bowl, add an equal volume of goat cheese, a drizzle of olive oil, chopped chives, and season with salt and pepper. Mash the potato and goat cheese mixture with a fork. Scoop mixture back into potato skins. Place on a baking sheet and bake for 20-25 minutes at 350°F, until lightly browned.